The cabin was great! We enjoyed our stay and had plenty of room for our large group to relax and enjoy the weekend. The view from the deck is absolutely gorgeous! My only issue with the cabin, was the parking situation. While I do understand that parking is limited on the side of the mountain, the parking situation could probably be adjusted to be more accommodating. Overall we had a great experience and would definitely stay there again. The bed frame on pullout in living room is broken. Thank you for your review, Maria! We appreciate your feedback! We wanted to let you know that the owner has replaced the hot water heater in this cabin since your stay! We hope that you will come back and stay with us again soon! This is the perfect location! The view is spectacular. I would highly recommend this beautiful cabin. Loved everything about this place!!!! The only exception was that it stated there were 5 sofa beds when in actuality there are only 2. We had 18 family members so sleeping arrangements were a little hectic at first but after that was taken care of everything else was fabulous! The view was great. We have been coming to Gatlinburg for many years and as the family grows so does the cabin! Cabins USA has always had plenty of cabin options!!! We will definitely be back next year!!! Thank you for taking the time to leave a review, Julie! Cabins USA and the cabin owner's appreciate feedback on the cabins. The owners of this cabin have added beautiful new log trundle bed/couches to the cabin since your review. We hope that you will come back and stay with us again and see the new furniture! Thank you for staying with Cabins USA and we hope to see you again! The property was absolutely amazing and the views were breathtaking. The driveway was not as bad as all of the other reviews state. The only thing I would change is that it says it sleeps 22 and I had about 20 people stay and I think that it was a few too many. Realistically, it probably sleeps 15-18 comfortably. The hot tub was great, the pool table was awesome as well. Overall, I would absolutely recommend this cabin and Cabins USA to anyone. Any questions I had were answered promptly and the express check in and check out was so convenient! Great View. Love the huge windows. Roomy main area. Refrigerator should have been replaced long ago. Dishwasher needed replacement and was very difficult to operate. The pool table had torn felt, as has been reported. Upstairs is hot. What appears to be a resident mouse around fireplace. Did see a bear cub just off the deck. Very docile. Driveway is hard to navigate without scraping. All in all the vacation and cabin were wonderful. The location was breath-taking. The parking was a not good, on a slope/incline. Other than that definitely coming back, more on ground level due to anxiety levels. Already looking. Thanks Cabin USA for a great adventure. This place has an amazing view. The cabin was large enough for our big group. Plenty of beds for everyone. The pool table was damaged in a couple of places and there was only 2 pool sticks of different sizes which were tipless. The refrigerator was not working properly, but it still kept things cool enough. The staff was awesome to work with when selecting this cabin. The parking was horrible. It felt like you were driving over a mountain to get into the parking lot. It did hold 6 vehicles though. We would definitely stay here again. The location of the unit was exceptional. The view of Ober Gatlinburg and downtown Gatlinburg was fantastic. The facility, although an older unit, was still nice and roomy. However even though we arrived an hour and a half after the scheduled time the unit would be ready to access (4:00 pm) the cleaning crew was still at the house cleaning. They were not done until almost 6:00 pm about two hours after the time we were supposed to gain access. Other than that experience I would enjoy renting this unit again. Great view of the ski slopes. Cabin was clean and organized. A little outdated but perfect for the time we spent in it. The cabin sleeper sofa beds weds to be updated. The refrigerator needs to be replaced. We had to spray because we saw roaches, the iron does not work. The basement need new windows with more installation and more small heaters in the winter. If the cabin could be updated it would be perfect. Overall it was okay but I would like an updated cabin if I ever visited again. Wow awesome cabin and view. Great time with family. When I first started looking at the reviews it appeared as if 90% of them stated that they saw bear...I thought that was odd until we were down at the grand pinnacle for 8 days and saw bear 7 out of the 8 days. I then saw some of the reviews for the driveway. Yes, the driveway is steep but so is the drive up and down the mountain. I would take the driveway again anytime for having probably the best view of the smokey mountains. Waking up to the view every morning was phenomenal. The only unfortunate and cool part of the whole trip was the bears. On the first night of being at the cabin we had a mamma bear and three cubs knock over our Harley Davidson causing damage. I would like to say that although it was an unfortunate thing in mother nature, Cabins USA was willing to talk to me and let me vent about the situation. Cabins USA was also willing to speak to my insurance company if needed to be. The staff at Cabins USA are very nice to work with and appear to be much happier then most employees with their jobs. The hospitality through Cabins USA was great. I must say I love the view of this cabin. Absolutely amazing!!! This was the first time my family of 20 brought my Mom to Gatlinburg for Christmas. However, this cabin needs some updating as far as sleeping. The beds and both sleeper sofas, some sleeper sofas being broke and we were not able to use. My daughter has scoliosis and this made it a little didficult. Beds need updating and couches extremely worn and not comfortable. The only other thing that was a little aggravating but we made it through. We needed extra towels and were told two different solutions by different staff members to each of my siblings when they stopped in to sign documents. Our plan was to cook & spend time at the cabin with my Mom, not having to go out a lot. But the last time we were told we have to bring the dirty linens back to Pigeon Forge before getting new ones. This is about a 15 min drive. We made it do without though. Would love to bring my family back next Christmas and stay in the same cabin, if the beds and sleeper sofas downstairs especially were updated more a more comfortable stay. The view makes you want to come back to this cabin. Continued prayers for the town of Gatlinburg and all the families involved. We will be coming back before Christmas again. Beautiful place. The view alone is worth staying here , but parking is bad , had an awesome time !!! I am so happy to hear you enjoyed your stay in Grand Pinnacle! We here at Cabins USA work hard to make sure each of our guests have the same great stay you enjoyed while vacationing in the Smokies. When you are ready to stay with us again, please mention you are a return guest for an additional discount. Thank you again for your review and thank you for choosing Cabins USA! This is a great property, but needs some updating. The upstairs shower leaks into the foyer below. The couches are very uncomfortable and need to be replaced. A gas grill would be better suited. We were told there was no firewood and that gas was supplied for the grill. When we arrived we found tons of firewood and no gas grill at all, so we were overprepared in one area and underprepared in another. Overall it was a great experience. Had a great time, loved the cabin. Parking was an issue, had to find somewhere to leave a couple cars. Fireplace was great. Could use some more comfortable furniture. Won't stay at this one again, but will definitely book with Cabins USA. I am happy to hear that you enjoyed staying in Grand Pinnacle! We here at Cabins USA work hard to make sure each of our guests have the best stay possible while vacationing in the Smokies. I have forwarded your comments about the furniture to our Owner Liaisons who will be looking into the condition of the furniture. When you are ready to stay with us again, please mention you are a return guest for an additional discount. Thank you again for your review and thank you for choosing Cabins USA! The parking was not good at all for a church group with 2 vans and a trailer. Loved the scenery over the ski slopes. The parking was a major issue. We had to unload the vans and then pull them in the driveway because the kids were afraid of the angle of the driveway. Having a trailer was a disadvantage because it had to be parked in the driveway. Very nice!! The parking was kinda difficult, but all in all a nice place. The location and view were both awesome. The cabin is a little old and some of the beds were not comfortable. The kitchen is too small for a group as large as ours. We plan to do another trip next Christmas but won't rent this cabin next time. Thank you for taking the time to let us know about your recent stay in Grand Pinnacle. We here at Cabins USA work hard to make sure that each of our guests have the same great stay you enjoyed while vacationing in the Smokies. Thank you for letting us know about the beds in the cabin. Your comments have been forwarded to our Owner Liaisons and they will be speaking with the owner of that cabin regarding that issue. Thank you again for your review and thank you for choosing Cabins USA! The cabin was really nice and the view was beautiful. We didn't see any bears which was ok with us. We would definitely stay again. I am happy to hear that you enjoyed your stay in Grand Pinnacle! When you are ready to stay with us again, please mention you are a return guest for an additional discount. Thank you again for your review and thank you for choosing Cabins USA! We had a wonderful stay. The view is amazing. The cabin was a little to far up the mountain but it was beautiful. We did have a visit from two bears everyday and was a little afraid to sit on the deck but other than that we had a great time hope to be back next year! I am so happy to hear that you enjoyed your stay in Grand Pinnacle and were even able to see some of our local wildlife! When you are ready to stay with us again, please let our reservationists know you are a return guest for an additional discount, please let our reservationists know you are a return guest for an additional discount. Thank you for choosing Cabins USA and we look forward to seeing you again soon! I like the property, especially the view to Smoky Mtns. However, I would prefer more bathrooms with a house with 6 rooms. Second, it takes 20 mins to drive from Gatlinburg downtown to this property which is tiring. Third, there is minor water at the washer/dryer room. All these issues are minor and we would consider booking again in the future. We had a great time the cabin was fabulous even though it was on the TOP of the mountain although this was explained to me when I made my reservations that was all on me being at the top didn't bother me it was the narrow winding road that got me I would recommend this cabin to someone but caution them about the height as it was explained to me I don't think I could stay in this particular cabin again but I would try another one that's not so high up. Some of my family remembers said they would return and ask for that cabin again. I am happy to hear that you enjoyed your stay at Grand Pinnacle! With over 300 cabins on our program, we are sure to have the perfect one for your next stay. When you are ready to stay with us again, please let our reservationists know you are a return guest for an additional discount. They can also help you find a cabin that is not as high as Grand Pinnacle. Thank you again for your review and we look forward to having you as our guest again! The only reason that there was not perfect 10s all the way down was because the internet did not work, but we survived and that was not a deal breaker for our family. Terri went so far over and above to help find us a place to stay that words of thanks are not enough! She turned our disaster of a family vacation into a happy ending. 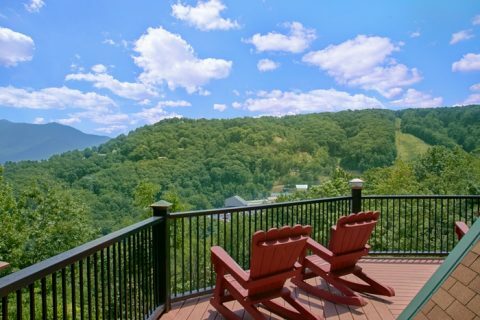 We will be letting everyone we know - family, friends, and social media included -- that your company is the best choice when booking a cabin or place to stay in the Smoky Mountains. Thank you so much for all of your kind words! Our reservationists work hard to make sure that each of our guests have the same great experience you did when reserving a cabin with us. I apologize for the issues with the internet. Maintenance has been made aware of the situation and will be working to correct that issue. Thank you again for your kind review and we look forward to having you as our guest again! Thank you for taking the time to let us know about your stay in Grand Pinnacle. Chalet Village is one of only two pools that require a pass in order to use them. We ask that our guests have those returned to the Pigeon Forge office on the day of check-out. I apologize if that was an inconvenience. We simply want to ensure that the next guests checking in that day are able to utilize the pool as well. Thank you again for your review and thank you for choosing Cabins USA! Perfect place for us to enjoy! We had just 4 ladies, so we had a bedroom left over. Since we split the cost, it was affordable! Would be a great place for a family reunion of a few families. The check in was great except they had lost my file so I had to come back on one of my days to sign papers the cabin it's worth the 50% discount definitely it has a gorgeous view but the parking it's the worst I seen I definitely not coming back to this cabin because of the parking otherwise is a nice cabin. GO CABINS USA!!!!! One of the mattress smelled like urine. The owner called stated he would handle it, but didn't for our stay so we list one bed, we didn't want to sleep on that lol. the pull out beds were very uncomfortable... The bedroom beds were awesome! The parking was terribly hard with five cars though. The hill was very stipe parking and narrow but we did it! The house was huge we had plenty of space for our large group! Only minutes from down town Gatlinburg!!! They need new pots and bad. We cooked a lot. They had a lot of towels really no need to bring any. Washer dryer worked just needs updating and that room. The furniture needs updating,...the game room needs more things for kids other than pool table. There was no TV,s in the bedrooms!!!!!!!!! Ugh The owner said he was go going to do that anyways. Overall a great great cabin though the negative things I've mentioned was minor and we still have a blast.